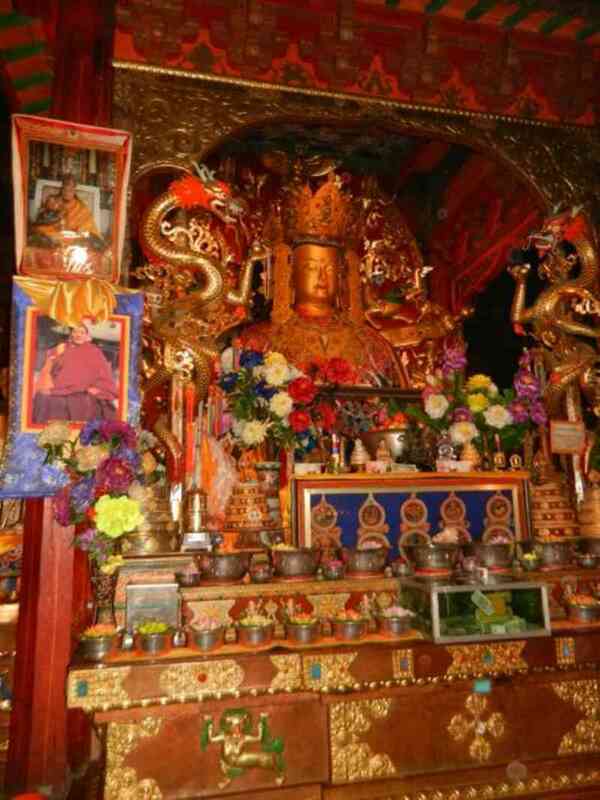 My first dawn in Tibet finds us at its oldest monastery , Samye. Though in existence for 1200 years, crowds of peasant style people roam through it anxious to leave offerings. 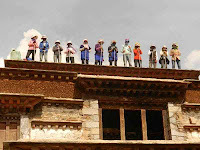 On the top of one roof about two dozen workers in sun caps and with poles beat down a ground agate rock roof to make it solid. Repairs are needed. 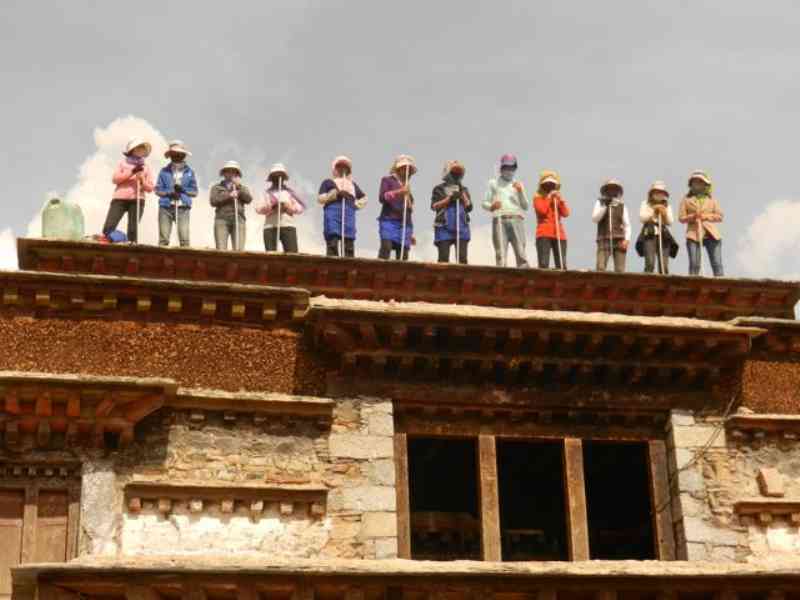 But most of the activity comes from pilgrims visiting the grounds. 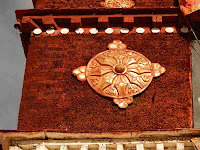 It has a fascinating overall shape of a mandela with the central temple representing holy Mt. Meru and the temples and stupas around it symbolic of the oceans (sigh - I'd love a dip in the distant seas), and the continents usually ringing the holy mountain. 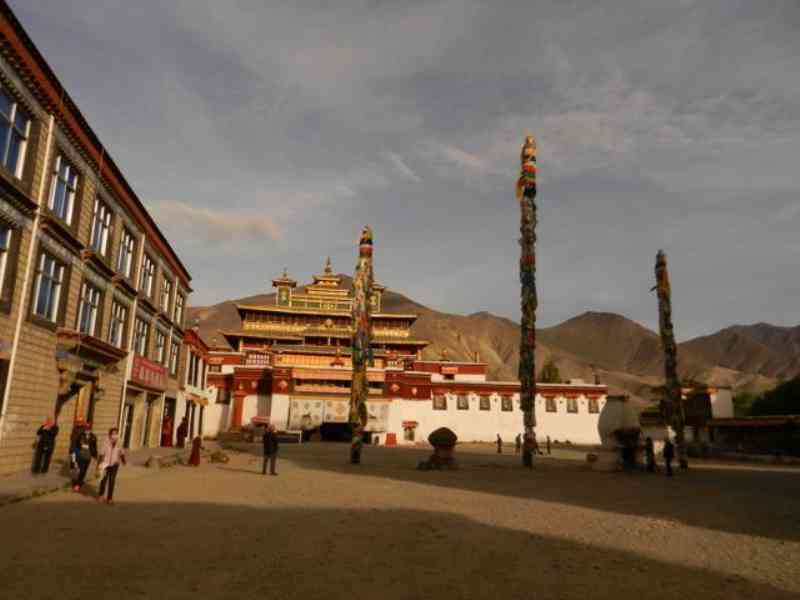 Originally it had 108 buildings (that's a big time number as is seven in Buddhism) and 1008 chortens on the wall around the monastery. 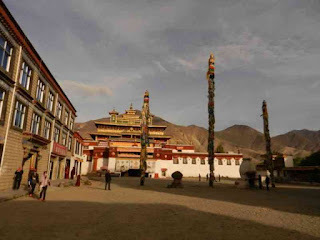 This is the original site for the birth of Buddhism in Tibet and it was almost destroyed during the Chinese Cultural Revolution. In a sort of sleepy food room on the grounds, we stirred the unprepared workers at 8:30 ready to eat. I had my first Tibetan breakfast which included fried egg between Tibetan bread, two segments of orange, one fourth of a banana, one slice of apple, sweet yak yoghurt and Jasmine tea. We sit in booths, the seats of which are covered in thick carpets. The windows so smudged the view is blurred need to be washed. Beautiful brown skin Tibetan families come through, women dare to glance at you and smile, children two and under are strapped tightly to backs of women, their little round faces curious at this white hair woman. I teach one to say "Hi." 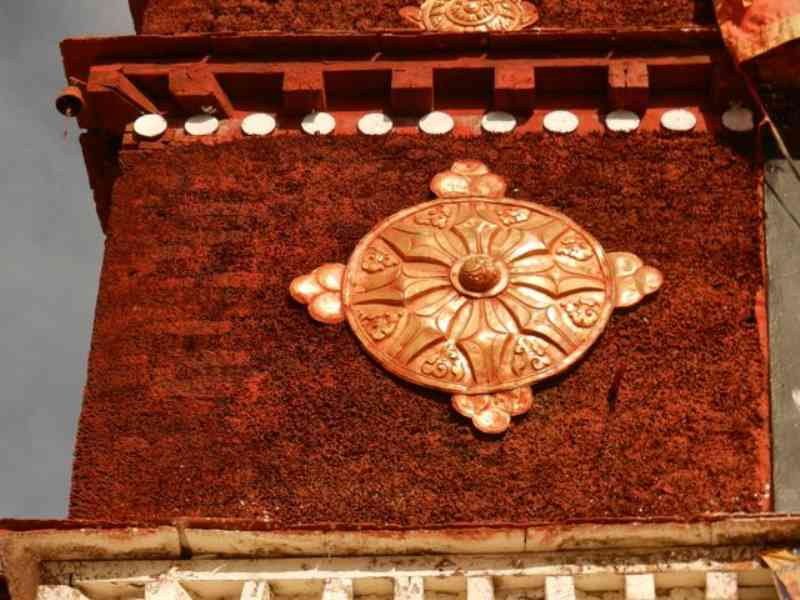 It is early and the sun glistens off the Samye Temple's golden roof. Gold once the currency for trade and to pay taxes, was and still is plentiful in Tibet, but when the 14th Dalai Lama fled, his followers didn't want to leave anything for the Chinese so the treasury was plundered. Now some things have been restored. My challenge here was to be able to climb up stairs not as wide as my hand, holding onto wobbly wooden poles used as rails or maybe a rope. There is a strange odor of a different kind of incense and a constant Ommmm to greet you. Pilgrims enter quickly with jars of white butter (monks make sculptures out of butter and it is also added to giant bowls of oil where masses of tiny candles burn). They take chunks of inedible white yak butter out of the jars and place it on altars. That might be fun to get one's hands into. There is nothing simplistic in a Buddhist monastery. In fact, each chapel is congested. I must not forget to go to the left of everything holy, that's clockwise. It's so dark you can't see the fully painted walls which have been there since time began. Every wall depicts some sort of adoration, aspect or history of Buddha. Giant figures line the sides of a single giant Buddha. 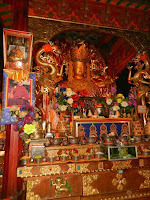 Most are likely dieties or revered manifestations of people like the founder of Tibet or a king, or some etherial religious figures. These sculptures are about 10 feet tall. 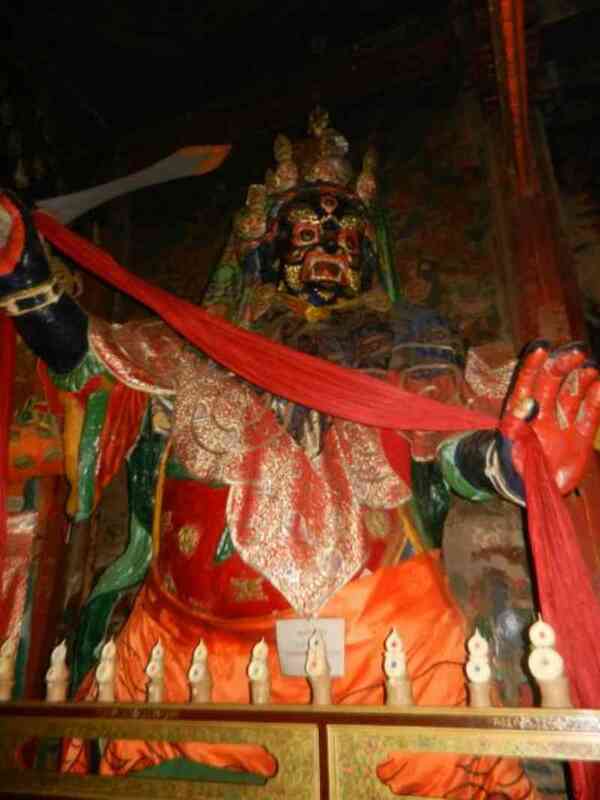 A pair of grueling monsters protect each entrance or sit or stand on each side of the Buddha figure. All statues are dressed to the hilt, I guess one would say, and a lot of it is now gold paint. Holy gift scarves called Khatas, mostly white and yellow, are draped everywhere. For a donation, I could take photos. Pilgrims bow and press their heads against so many points and places (like we anoint foreheads and put ashes on our foreheads to start Lent) - I guess you have to be a Buddhist to understand why they choose the places they stop at and they say rapid almost chanted prayers as they move through the different passages. 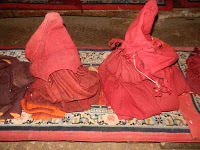 Monks wrapped in red wool bustle about adjusting their robes or sit cross legged on the floor as they read sacred scripture from antique books stored in cabinets at the back of the room. 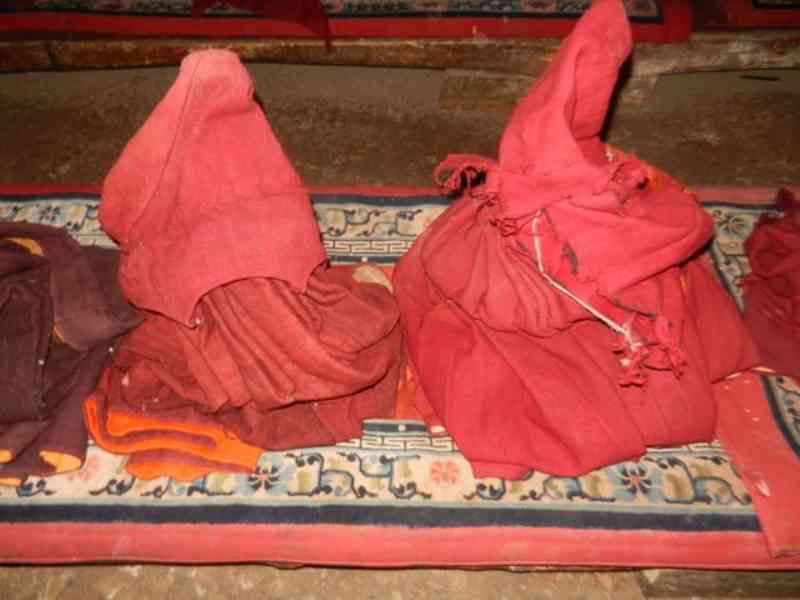 Their red capes are neatly folded into triangles and placed on the seat they would occupy during a ceremony. There is hardly space to breath for the hanging fabric victory banners, flags and streamers, some seem quilted. None are allowed to be in homes, only in holy rooms. It is dark and cleanliness is not part of godliness. There are three floors of three Tibetan art styles to peruse . 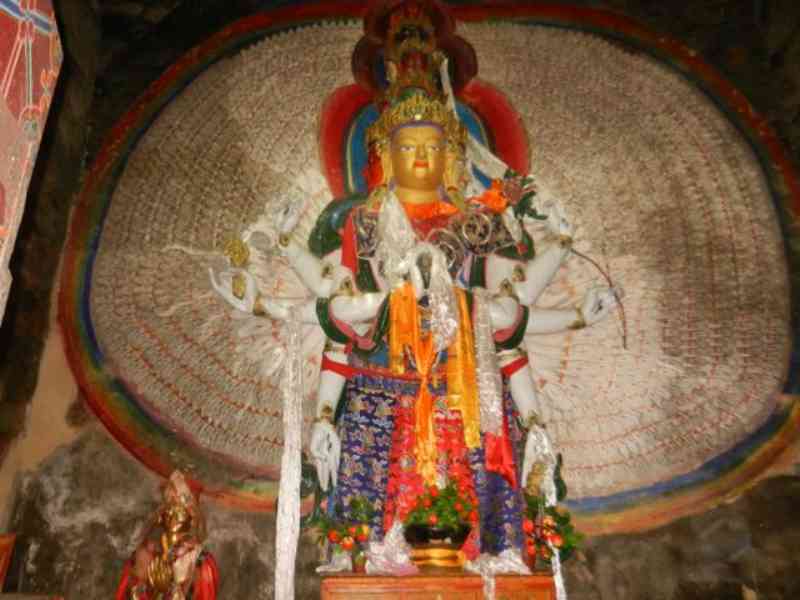 The first has a 12 foot high statue of Buddha dressed in Tibetan finery. The second floor there is a Chinese style to the beams and the figures. Thin sticks have been compounded together and painted red, as seen in most temples, because that keeps water from entering the temple. Interesting concept. Then the third floor. a recent edition - is India versions of statues of 4 of the 5 Buddhas and a wooden screen around the balcony, reminding me how in Jaipur palaces wooden screens protected women who were not allowed to be seen by any man but their husbands, so they could watch what was going on out in the square. They could look out. No one could look in. After leaving here, exhausted with information, we hit a dirt road for a 60 mile "short cut" to get to Lasha. It took about 2 and a half hours over sand and rock, hot sun glaring, and no air condition in the vehicle. When we suddenly reached the new bridge over the river, it was cool sailing on a well marked modern highway which went through a new mile and a half tunnel. Arriving at Lasha quickly, we found an enormous city much changed from the last time my guide Jim had seen it. 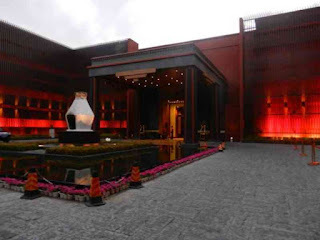 And our hotel was really something out of Amagani style - and it was a real St. Regis Hotel, a great reprieve from the bustle of Nepal and Tibet. The bathroom is superb with mood lighting. Shangra La, is it you?